Although groundbreaking activist, art-rock performer, author and spoken word artist Otep Shamaya has been awarded for bringing awareness to political injustices, women's rights, and animal rights, some of her greatest strides for equality have been made in her fight for increased LGBTQ+ rights. As a member of the LGBTQ+ community herself, Shamaya is thrilled to announce that she will officially take over the HER Instagram account "Stories" on Thursday, March 22. HER is the largest community for lesbian, bisexual and queer people worldwide. 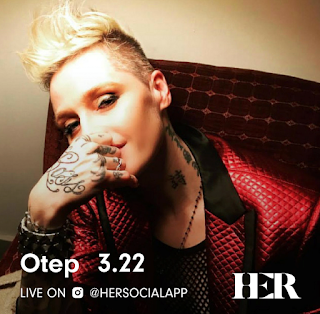 Make sure to follow the HER Instagram account @hersocialapp and check out their "Stories" all day for an insider's look at what's happening with all things OTEP. To learn more about the HER app, visit www.weareher.com. Otep Shamaya says, "Not too long ago, we had to camouflage our authentic selves. We had to hide the most beautiful parts: who we loved, who we wanted, who we were. But with our untethered devotion and companies like HER, we can now live out loud! And that's why this takeover is so important to me. It's an opportunity to reach so many strangers who know nothing about each other but share a common struggle, a common history, and a mutual future of equality that we will create. This takeover is going to be a lot of fun and elucidating. Thank you for this amazing opportunity. See you soon!"